Since then, I’ve done my fair share of cake related chores and more cakes than I can count have come out of The Baking Room’s kitchen. With the mixed feelings of trepidation and excitement that come with the certain knowledge of impending beer drinking, beer drinking, beer drinking and other Surly related mayhem came the cake order. “Oh bejeesus. 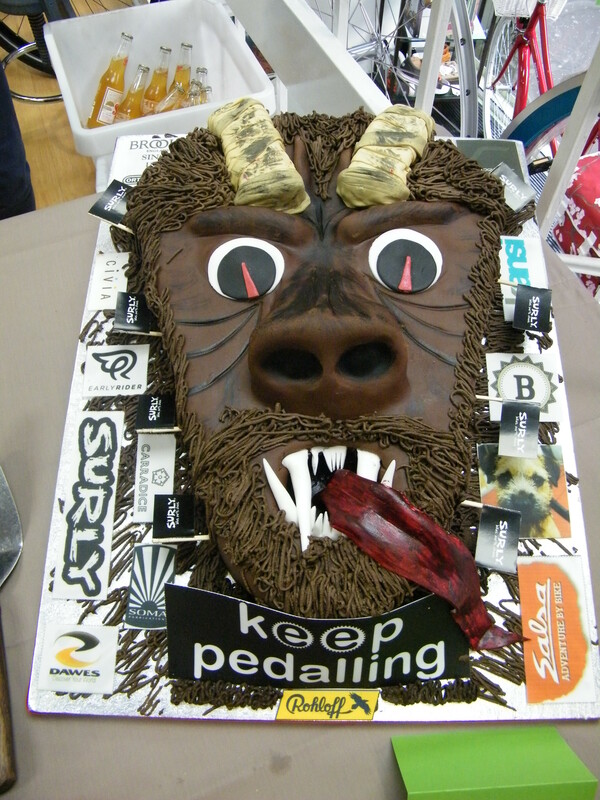 If they ordered the Krampus cake last year, what in the hell are they going to ask for this year?? ?” was the gist of the conversation I had with Karen. We didn’t have to wait long to find out. When Shona started pushing her chest out and hinting I should take a closer look I didn’t quite know what do. I looked over at Rich who was grinning with a knowing look on his face. “Oh, it’s going to one of those parties…” I thought to myself. “Look at my shirt!” Shona insisted, pushing her chest out even more. Eventually I caved… I mean, what’s a man to do? Anyhoo, Shona was wearing her Surly t-shirt. 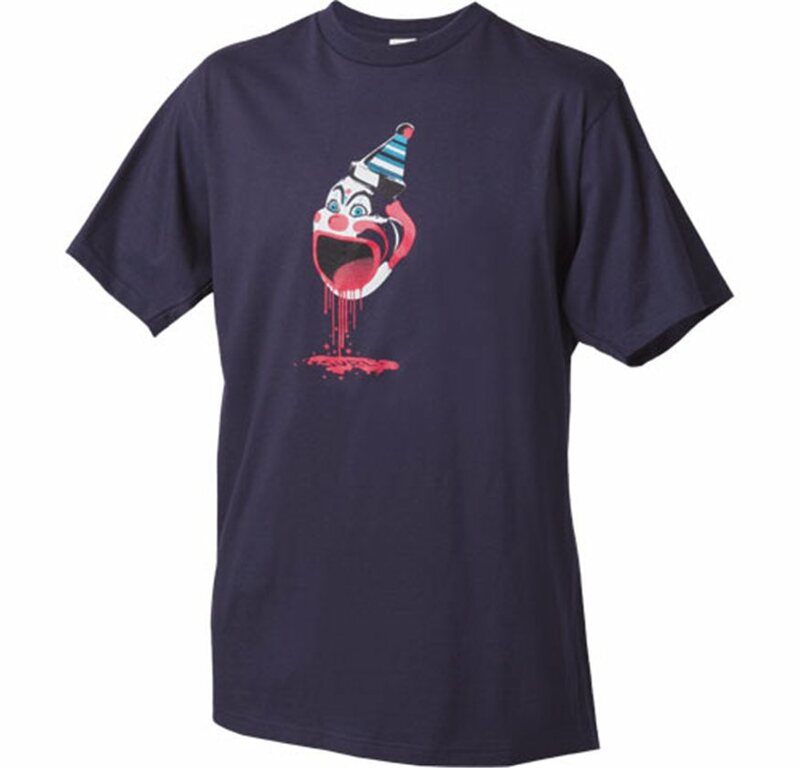 You know the one, it’s got a creepy picture of a dismembered clown head with blood pouring out of its mouth. After remarking on how cool is was etc. etc. the realisation slowly dawned on me. Yep, the way to top last year’s Krampus cake: A 3D cake version of the creepy Surly clown head with blood pouring out of its mouth. “What’s your budget?” was my first stupid question. Some time later after I’d explained the whole concept to Karen and we’d been through several different design ideas and eventually settled on the realisation that somehow making the cake actually bleed would be more challenging than time or budget allowed for, we delivered the final product and set it up with only minutes to spare before the party started. 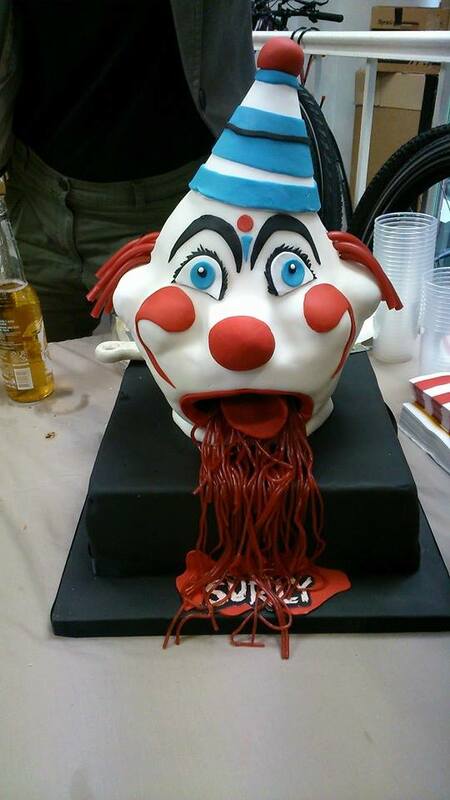 I have it on good authority that a number of people with serious clown phobias have had sleepless nights as a result of seeing this cake. Yeah? You wanna try making the damned thing! Next year I’ll make an effort to blog more often. 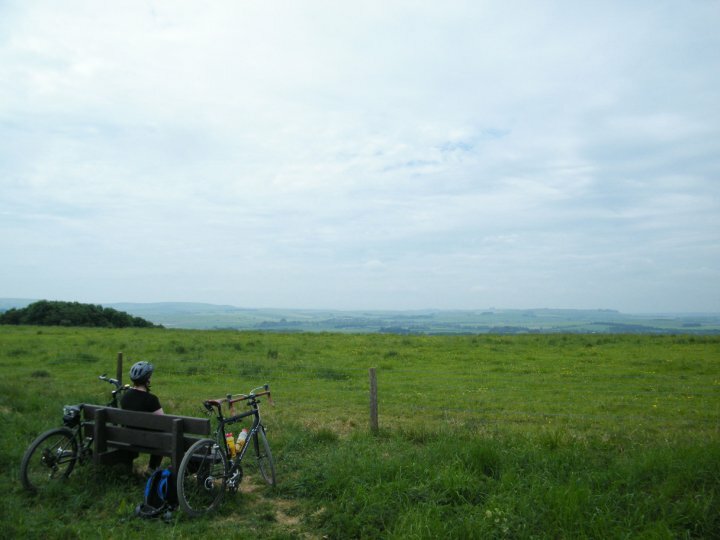 Next year I’ll cycle to work every day, whatever the weather (unless I’m dead or dying). Next year I’ll ride more. Next year I’ll keep track of mileage. Next year I won’t make any new year resolutions. Here we are in mid-February and so far I’ve failed miserably at 1, 4 & 5. Happily, I’ve been staunchly adhering to 2 & 3 (even when I’ve been dying [of Man Flu] and, a couple of times, when I’ve narrowly escaped ending up dead). My latest commuting steed (Surly Ogre) has been doing a fine job and all the money I splurged last year on Gore waterproofs has proved to be worthwhile. Heck, I’ve even got dynamo lights on my bike these days. When I rode in at dark o’clock this morning, I thought I felt a optmistic nip of spring in the air… by the time I’d made it my meeting in Coventry, a snow storm was in full force. By lunchtime, the blue skies and glorious sunshine I gazed longingly at through the office window made me hanker for those long hot summer days and the ride home at dark o’clock this evening was cold, wet and windy. England, what a country! So yes, we’re very much still alive and kicking cycling here at lifeinthecyclelane HQ and there’s plenty to update you on in the coming months – please, try to contain your excitement. Wait. What happened to the summer? I did manage to bag a few days off work, during which I had every intention of getting well and truly lost in North Wales. I bought new front panniers, test packed all of my gear, picked out camping spots and even planned the route. But, as is often the way with Mice and Men, even the best laid plans often go wrong. Struck down with what can only be described as the worst case of Man Flu ever recorded (the pathetic complaining was particularly bad), I had to admit defeat and spent my holiday on the couch, dosed to the eyeballs with Lemsip (other high quality medicines are also available). Since then, I’ve been half recovered, half exhausted… struggling to get out of bed, struggling to shift lingering lower back pain and a persistent headache, struggling to cycle even the 6 miles to work without exhausting myself even more. Happily, as September draws to a close, I’m starting to finally feel a bit better and have even managed to return to commuting by bike. So, even though yet another Summer passes me by without getting away on a bike tour, I take pleasure in the cool, foggy mornings, approaching dark evenings and the serenity that comes only from a country lane / forest track completely devoid of fair weather cyclists. In any event, I will certainly be making more effort to bore you to tears entertain you with tales borne in (and out) of the cycle lane. 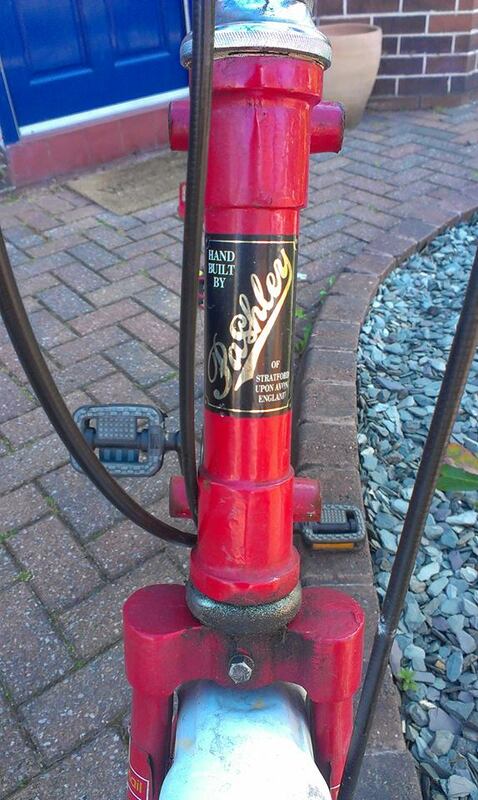 Oh, for now, just a little teaser… what do you reckon this head badge is attached to? On this morning’s commute, a BMW driver took what I can only describe as an irrational dislike to me and, not content with taking one swipe at me, decided I had no right to be on the road at all. Much to the confusion of every other road user around us, I might add. As I calmly asked him if there was some kind of of problem, he continued to shout obscenities at me through the safety of his closed window which he refused to open… quite what his problem was, I do not know. On another day, I may well have taken the bait and retaliated but, not today. I simply waved him by and carried on, obeying the rules of the road as he chose not to. 12 hours later, I still have no idea what his problem was… don’t get me wrong, I have my own anger management issues of which I am all too aware but this guy brought a whole new meaning to ‘irrational’. Why am I blathering on about this nonsense? Well, on the same day I experienced what I can only describe as pure, pathological hatred for cycling, I also heard this song which reminded of the absolute opposite end of the spectrum and what I can only describe as the pure, simple therapeutic effect cycling can have. This is my dear friend Ruth. Ruth knew the location of a secret orchard where we scrumped apples & blackberries to make The. Best. Crumble. Ever. Ruth was a ‘Bike It Lady’ and taught kids in schools how to fix punctures, how to ride safely and how to fasten a helmet. Ruth loved to ride her bike(s), very often with trailer in tow – on this scrumping trip, I was towing it and you can just see her crutches poking out at the very bottom of the picture. You see, Ruth suffered from cancer and was cruelly taken from us far too soon. But did cancer stop her from cycling? Did it hell. In fact, I reckon her absolute defiance to quit cycling even when she wasn’t strong enough to walk was one of the things that kept her with us just that little bit longer. In the midst of it all, despite cancer’s best efforts, she’d wake up, throw those curtains wide, stick her crutches in the trailer and head out to teach kids about cycling. This was one of my last rides with Ruth. I shall remember it always. We interrupt the regularly scheduled lack of posting to provide a quick update on recent developments here at lifeinthecyclelane HQ. As you know, we ride year round in these parts, no matter what. 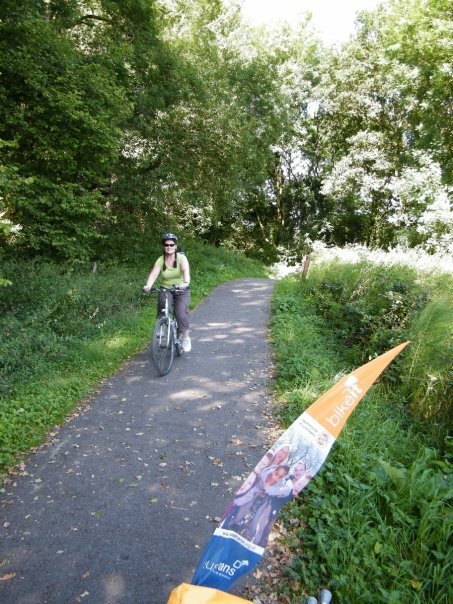 With the UK currently experiencing a much needed spell of hot, dry weather, every fair-weather-baggy-shorts-and-t-shirt-wearing-dangerous-red-light-running-clunky-bike-riding-amateur is out in force; skipping on and off of pavements, making ill considered manoeuvres, endangering themselves and others and basically giving the rest of us a bad name. 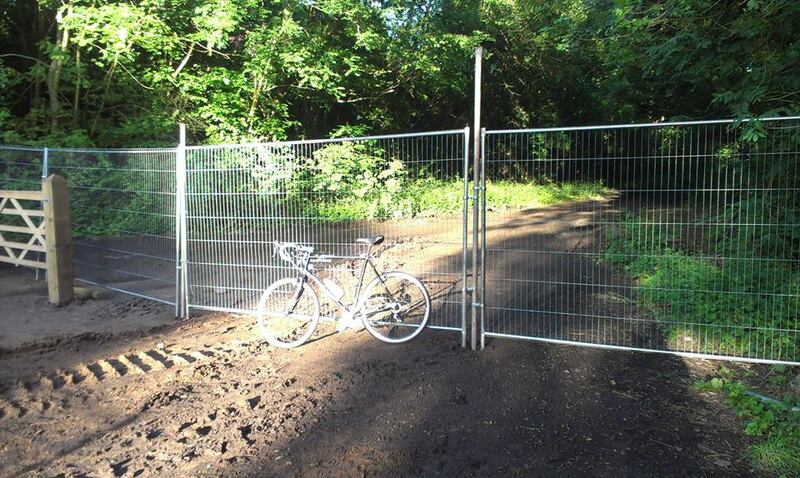 So, I’ve been out exploring, looking for roads and trails where other people are not. For reasons I do not fully understand, just about every turn I’ve taken recently has brought me face to face with some kind of obstacle. Signs proclaiming “No cycling”, “Cyclists dismount”, “Private road, no public right of way”, “Road closed”, “No entry, private land”, “Golfers only” and the suchlike abound. 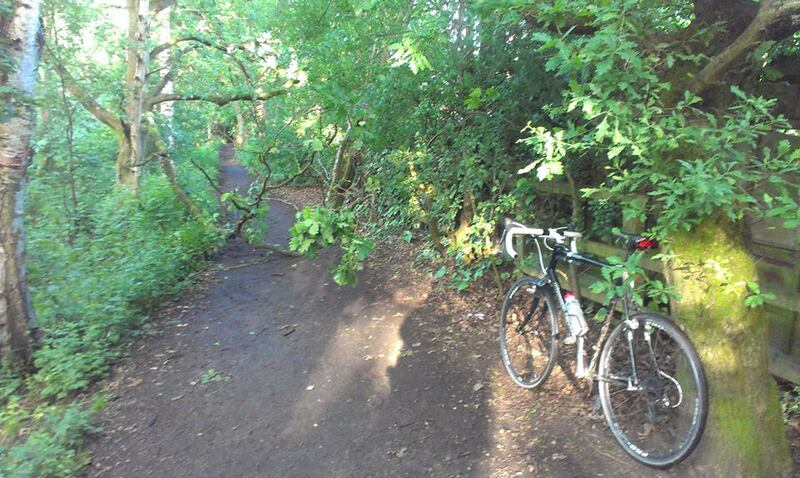 And, if there wasn’t a sign, a tree had somehow inexplicably fallen across the path – one, I could accept, but three separate trees felled in the space of 1km of the same trail? Seems a little suspicious. And then, finally, ultimately, impassably, a gigantic metal fence and no way out but back the way I’d came via all the downed foliage. Last night I took off in the absurd heat determined to get lost in the wilderness and lost I got. 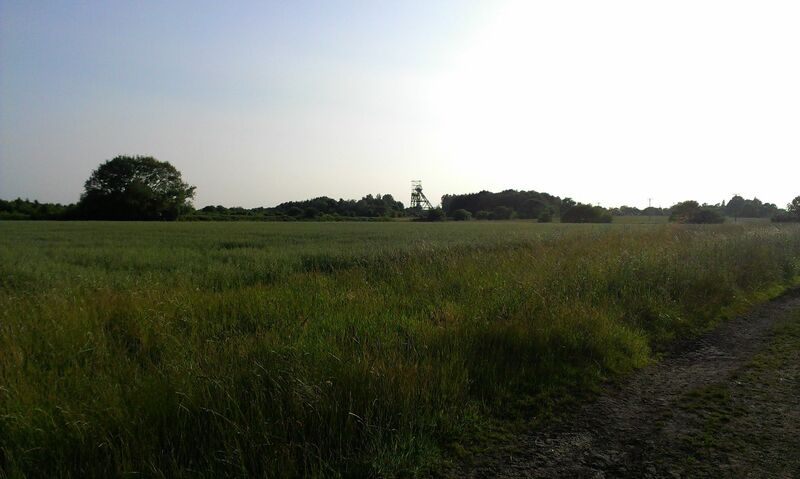 Full on, riding through the middle of a field of 6ft tall grass with no idea which direction I was headed lost. Over the train tracks and far, far away down the gravel roads lost. 3 hours at full tilt, lactic acid burning my thighs, barely enough energy left to get home again lost. Didn’t see another soul for ages because I was in the middle of nowhere lost. I never was any good at geography. Convinced, I was. 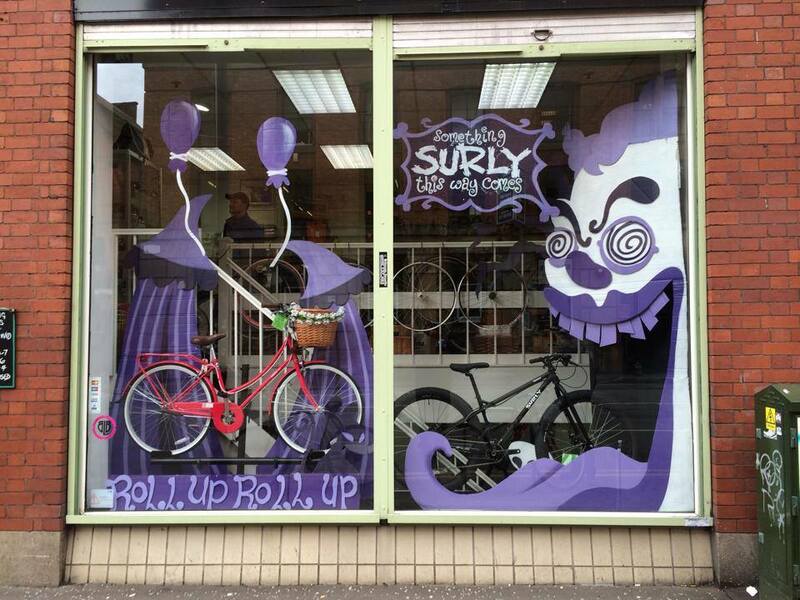 Convinced that Surly was an English brand… I mean, who else could build such random stuff than the English? Well, the Americans, as it turns out. Seems that Surly are based in Minnesota… well, that doesn’t make me like my Troll any less!